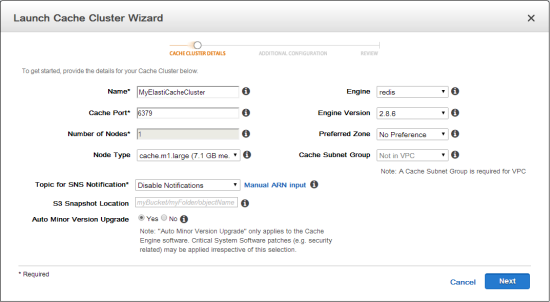 Amazon ElastiCache makes it easy for you to create, operate, and scale an in-memory cache. Because ElastiCache contains support for the Memcached and Redis engines, it is compatible with a wide variety of existing applications. Partial Resynchronization With Slaves – If the connection between a master node and a slave node is momentarily broken, the master now accumulates data that is destined for the slave in a backlog buffer. If the connection is restored before the buffer becomes full, a quick partial resync will be done instead of a potentially longer full resync. You can use the new repl-backlog-size parameter to set the size of the buffer and the repl-backlog-ttl parameter to control its time to live, measured in seconds since the last successful communication between the master and the slave. Better Consistency Support – You can now configure Redis to stop accepting write operations if less than a certain number of slaves are connected (the min-slaves-to-write parameter) or if the time lag between master and slave has become unacceptably high (the min-slaves-max-lag parameter). New SCAN Commands – You can use the new SCAN, HSCAN, ZSCAN, and SSCAN commands to incrementally iterate over a Redis collection. You can opt to scan all elements or only those which match a regular expression pattern. Keyspace Event Notification – Redis client apps can now subscribe to PubSub channels in order to receive notification of changes that affect a data set. The subscription model is very flexible and can be configured to generate one or more events in response to a wide range of operations on the data set. You can read about Redis Keyspace Notifications to learn more. As I mentioned earlier, this new version of the Redis engine is available now and you can start using it today. You can launch a new ElastiCache for Redis cluster or you can upgrade an existing cluster to version 2.8.6.